Vaporesso Nebula Review: A Thinking Mod, How Good Is That? Vaporesso have been tirelessly providing us with some very good looking and performing mods over the past few years and they are back with a brand new mod which is called the Nebula. It’s a 100W mod that can be powered from a single 26650 battery or a single 18560. 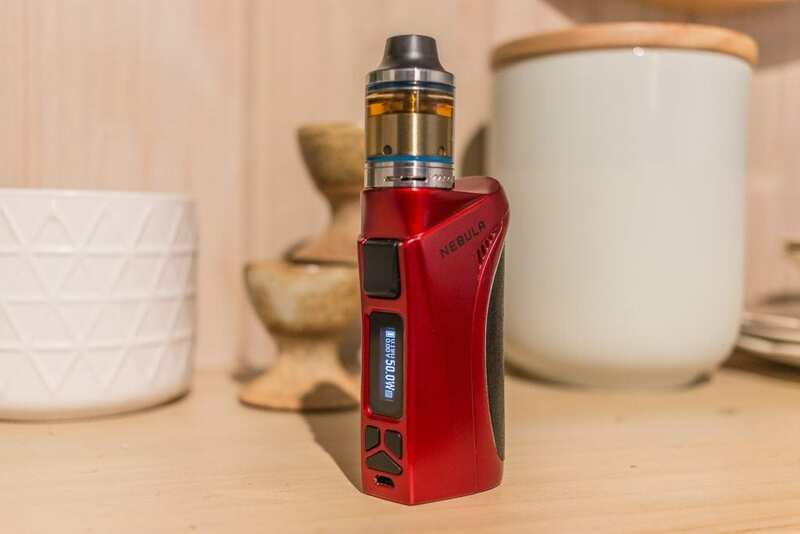 Taking it’s conceptualization from the likes of the Target Pro and Target Mini, the Nebula has spawned and is the next step in the game from Shenzhen manufacturer Vaporesso. Keeping in line with their sleek looking mods, the company have also developed the OMNI board which is the lifeblood of this new offering. We are going to have a look at the Nebula from Vaporesso and dive down into it’s usage, how it performs, the pros and cons and finally I’ll wrap up with my thoughts on recommending this device. I’d like to thank GearBest for sending this my way for the purposes of this article. Vaporesso Nebula Review: All 100 Watts of It! First up, the packaging in which the Nebula came was very appealing. It has a picture of the mod in front of an almost intergalactic looking background, very space like, entailing a Milky Way-esque star scape. Making it look like it belongs in a galaxy far far away. Super safe packaging means that the Nebula definitely will not be harmed in any way in transit. It comes with a very well made, braided micro USB cable. This is definitely an upgrade from the standard cheap black USB cables most mods ship with these days. This really shows a sign of quality and attention to detail. Each end of the connector is protected by a spring, which should help this good looking cable last even longer. It also ships with a battery adapter band. This means you can use an 18650, in place of the 26650, by simply wrapping this band around it. It makes the 18650 then the same width as a 26650 therefore holding it snug in the battery compartment. Taking it out of the box and getting a good look at it for the first time is certainly exciting! This thing looks amazing. It looks so sleek and futuristic, making it stand out a mile from any other mod that I own. I thought the Target Pro and Mini looked cool, but this thing takes that to a whole new level. Vaporesso have certainly delivered again, putting out another device on the market that doesn’t conform to a true box shape. The Nebula doesn’t have any straight edges to be found. The leading lines and curved design leave your eyes running all over this thing. The battery door is rubberized, making a very comfortable and sturdy grip in the curve of your hand. With the curves leading up to the back of the battery door exactly where it feels comfortable to hold. The front of the mod contours in towards the screen, which also aids in a natural resting spot for your fingers to lay while you rest your pointer finger on the fire button. Even the fire button is contoured to the curve of your finger. The Nebula is an ergonomics powerhouse, which feels so comfortable in your hand. It feels like it belongs there and you will not get fatigued holding it at all. The battery door is very easy to slide out, however it is also just as secure being held in by just the right amount of magnets. The screen looks to be just the right size, showing the important information in a big enough font, you don’t have to squint your eyes to read it. There are 3 other buttons neatly placed just under the screen. These are the + / – buttons and the menu selection button. There are ventilation holes in the top back corner of the mod, that look really cool as they contour up along the battery door. The 510 connector looks to be of a quality construction and there are juice run off holes around it which can also act as air flow to cool your atty down from underneath. There is a micro USB port neatly tucked away on the front, below the menu button, I’m glad it’s on the front as I hate to have to lay my mods down when charging them. Installing the batteries into the Nebula is a piece of cake. Simply slide down the battery cover towards the bottom of the mod and it comes off completely. The battery is orientated with the positive side up and you install the battery by nudging the positive end up into the spring loaded positive pin. To use an 18650 in place of the 26650, simply make use of the battery band and place it over the 18650. It then makes the 18650 the same width as the 26650 holding it in nice and tight. Bear in mind that the maximum power output of the 18650 is reduced to 80 watts – more on this later. 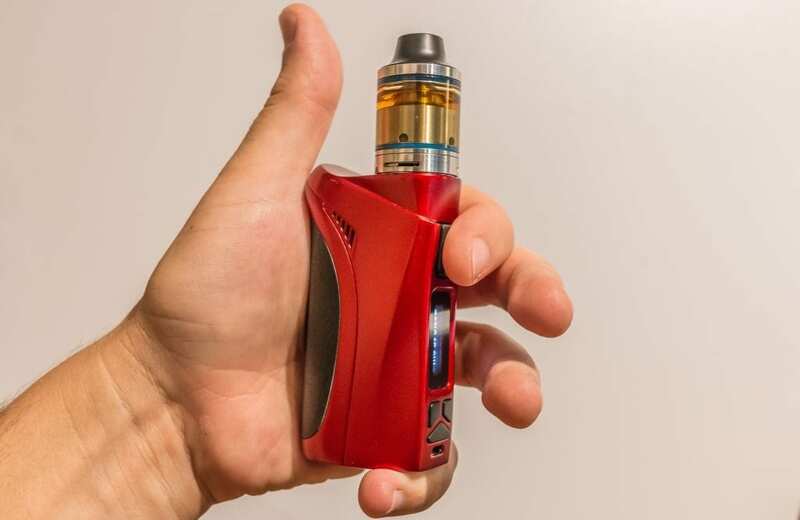 Screwing your atty down onto the 510 connection seems like there is a little bit of resistance to begin with. I think this is just due to the fact that it will not let you screw it down on an angle or strip your threads. You have to concentrate on getting the atty lined up correctly before it will accept it. I see this as a pro rather than a con, as I would prefer that the threads on my atty, and the mod for that matter, are kept well in line without the chance of damaging or stripping out. To power the device on and off you hit the fire button five times. The first mode it comes to is VW mode and it displays an S, which stands for Smart. After asking you if you have added a “New Load” you answer yes or no with the +/- buttons. The Smart function will then predetermine and recommend a wattage based on the resistance of your build – and I found this to be pretty spot on. A mod that thinks for itself, how good is that?! Although the OMNI board may not pick the best setting to start with, you can always tweak it from there and it’s a great start especially for new attys that you haven’t vaped before. To cycle through the other modes you need to hold down the menu button, it doesn’t have a scroll-able menu like most mods do. While this is a subjective con, it really doesn’t bother me – it just takes a little while longer to dial in your perfect settings. When you power off the mod, it will remember the last settings and come back to them when you power back on. I personally like the fact that it doesn’t have a scroll-able menu – another thing that helps this mod stand out from the crowd and doesn’t bog you down with useless nomenclature. The OMNI board has the following settings available; Smart VW, CCW, VT (Ni200/SS/Ti), CCT, TCR, and Bypass mode. Smart VW (Variable Wattage), as mentioned before, TCR and VT (Variable Temp) act as they do on most popular mods on the market these days. CCW (Custom Curve Wattage) and CCT (Custom Curve Temperature) in my view is the standout offering on the Vaporesso Nebula. This feature is like a preheat setting on steroids. It enables you to dive into the first five seconds of your draw and set a custom value for every half a second. It’s like creating your own heat curve, but to the infinite detail. It’s great for those heavy coil builds that take a bit to ramp up, but then you can back off once they’re at optimum level to both save battery and not blow your head off with too hot of a vape. You choose your curve levels in watts in CCW mode and in degrees in CCT mode. The Nebula works in both Fahrenheit and Celsius by the way. Finally, bypass mode acts in the way a mechanical mod would. Giving you the sum of whatever battery power is left the cell. Vaporesso have slammed a heap of protection features into the Nebula, which is always good peace of mind for the avid vape enthusiast. To get the most of out battery life, these features include Low Voltage Protection, Output Short Circuit Protection, Low Resistance Protection, Overheating Protection, Current Protection, Load Protection, Timeout Protection, and Anti-Loaded Battery Protection. Is that enough protection for you? The Nebula can accommodate attys up to 25mm in diameter and really looks good with pretty much any atty on board. The 510 connector was a little tight to begin with, having to push down on the atty to get the threads to take. This soon got easier once the mod was bed in a little and now there is little effort required to tighten down your atty. I have to say I do prefer this over a loose 510 connection, as I know my attys will be safe and secure with not chance of stripping or bending the wrong way. I found the output on the OMNI board to be really enjoyable and very consistent. The ohm readings are spot on, in comparison with other high powered mods in the same performance bracket, which helps with temperature control and getting your perfect vape. Smart VW and VT mode are consistent and do what they advertise, nothing really new here from other mods on the market apart from the fact that they work very well, are solid and will not let you down. The preset values in VT mode, I found to work perfectly for my different TC wire builds and didn’t have the need to go into TCR mode to edit any of them. Although you do have this opportunity on the Vaporesso Nebula, I didn’t feel the need to utilize it – keep in mind I do run the most common and preferred TC wires rather than anything outside the box. The custom curve feature really knocked my socks off and I think it delivers outstanding performance. Once you get in an setup your curve and tweak it here and there, you can really feel your sweet spot getting even tighter. Especially in Temp mode, I found that after a few small tweaks on my curve, I was getting a ridiculously good vape. This was in terms of flavor, vapor production and battery life. And I really appreciate that Vaporesso have put some thought into this epic preheat function. On other devices, that aren’t as customizable as say a DNA device, you can only set one preheat value that lasts for a nominated amount of seconds. The fact that the OMNI board lets you dial in a value for every half a second up to five seconds, really blows my mind. And they way they have designed the menu to dial it in, it really couldn’t be any simpler. If you haven’t picked up on the fact that I am well and truly impressed with this feature of the Nebula, then I’m telling you again – this is freaking awesome! Bypass mode is very quick and direct, almost as quick as a mechanical mod – just without the tactile switch sensation. It delivers the full capacity of the battery in a quick and efficient manor. If your a fan of mech mods, or have a particular atty and build that benefits from direct power, then you can still get that desired effect with the Nebula no worries. Talking about batteries, for my average every day build I vape on average around 50 watts and I was finding that a full 26650 would last me the whole day, if not into the next comfortably. I currently stash an extra 26650 in my vape pouch that I carry with me and I would average about three days of vaping – depending on how heavily I vape on any given day. 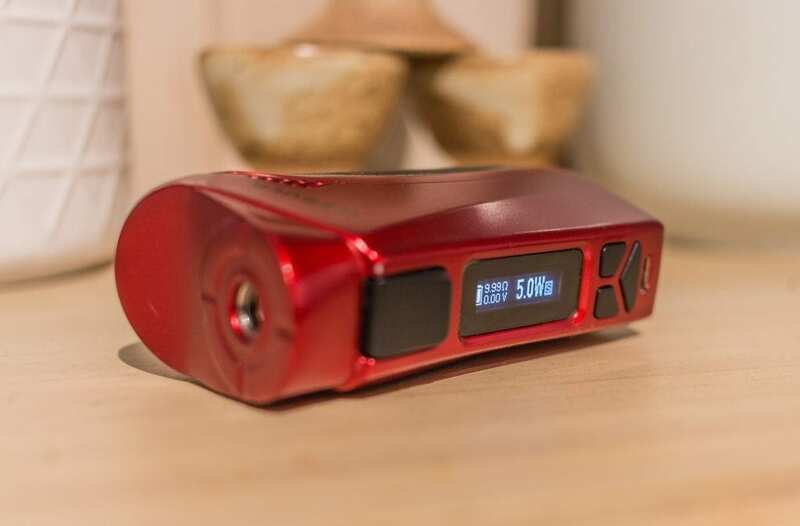 For those of you who will utilize the 18650 mode, keep in mind it will limit the maximum power output to 80 watts and obviously effect the vape time you get out of a battery before having to charge. The output of the mod does start drop off slightly when it gets down to about a quarter battery. You can tell ever so slightly that the power is diminishing gradually and that it will soon be time to swap out your battery. You still have plenty of time before it will die on you, but you can definitely tell when it’s getting time to replace your battery. This is something that I am conscious of and usually despise in a mod, but for some reason on the Vaporesso Nebula it doesn’t upset me that much at all. I think because the depletion is only very slight and the fact that it doesn’t all of a sudden just die on you. I can live with this every so slight dip in output, considering the battery life and quality of performance up until this point. The finish of the mod looks stunning, almost like the detailing done on a showroom car. I had the mod in my pocket and knocked it on the corner of a desk, the point of impact did create a very small paint chip, so bear in mind this finish will chip so be careful. The Nebula is most definitely pocket friendly due to it’s size and weight, which is a huge pro in my book. The power to weight ratio of this mod really is very good. The USB on the front can be used for charging your battery or applying firmware updates. And I love the fact that the USB port is on the front and down towards the bottom of the mod. This means that firstly I don’t have to take my tank off and lay it down to charge. And secondly being down near the bottom of the mod, the center of gravity helps to eliminate knocking the mod over when it’s connected via cable. Sometimes when mods have the USB lead near the top of the mod, the lead can drag it down and knock the mod over, or the lead can invariably get caught by something and cause a tip. I honestly take my hat off to Vaporesso for not trying to win over the market with the latest and greatest fad. What they have done with the Nebula is highly commendable and that is to return to the single battery mod and refine it even further. A job which they have done very well at. 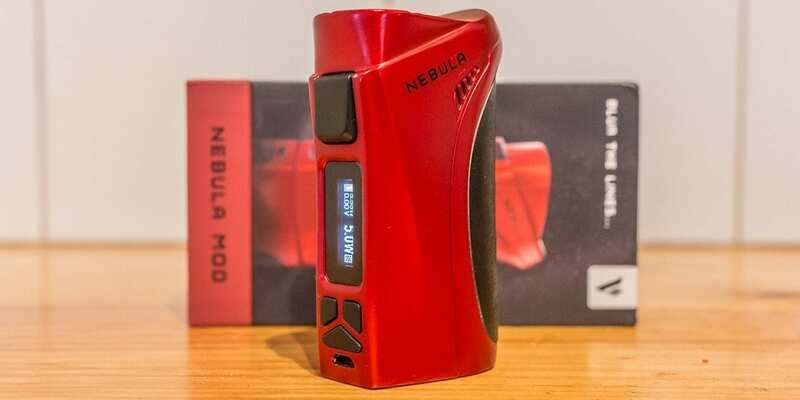 Based on awesome looks and top notch performance alone I would have no hesitation to recommend the Nebula to anyone who is in the market for this kind of device. But to back it with such great functionality and customization really helps this mod take the icing on the cake. If you want something that looks good, is battery efficient, is light and pocketable, performs well and is highly customizable – look no further than the Vaporesso Nebula – I highly recommend it and it has risen to the top of my favorite mods in rotation. I hope this has helped you in your search for your next high powered mod. If you have any questions or comments, please leave them below, we always love to hear what you have to say.